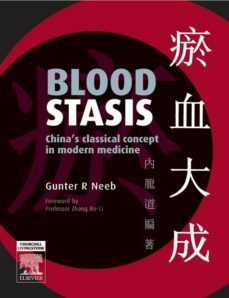 BLOOD STASIS: CHINAS CLASSICAL CONCEPT IN MODERN MEDICINE covers the area of blood stasis in Traditional Chinese Medicine, drawing from a huge range of original Chinese material. The book discusses many Western diseases including diabetes, gynecological disorders, stroke, tumors, myocardial infarction, and the interaction of these with other pathological factors. The book also provides both classical and modern differentiations and treatments, including both herbs and acupuncture in all categories with appropriate case histories.Thoroughly examines the concepts and processes of blood stasis in Traditional Chinese Medicine.Draws on original translations from Chinese sources ranging from the classical era through modern times.Describes, in full, the historical perspective of Chinese Medicines presentation of blood stasis theory and also includes modern research for a balanced view of the effectiveness of blood stasis.Highlights recent detailed analysis of blood stasis and herbs.Incorporates real-life cases helped by blood stasis therapy.